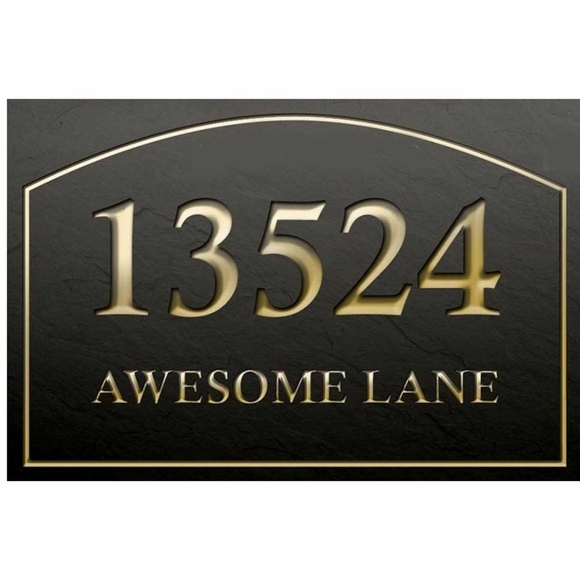 One Side Hanging Address Sign with Border - - personalized 12" x 16" slate plaque. Custom made for you. Horizontal orientation with two lines of text. Line 1 holds the address number; up to five 4" characters. Four color combinations: white letters & border on black; gold letters & border on black; black letters & border on green; white letters & border on green. A vertical version of this sign and an optional bracket are also available (see Related Products).